Celebrating global projects that integrate commissioned art with architecture, interiors, and landscapes, the Collaboration of Design + Art Awards were launched this year by The Art Commission of Madison, Wisconsin, and spearheaded by co-CEOs Toni Sikes and Terry Maxwell and senior advisor Ilene Shaw. The debut edition attracted 433 entries from 29 countries—proving that already, as Interior Design editor in chief Cindy Allen says, “CoD+A is a keeper.” Hall of Fame members George Beylerian, Clodagh, and Kevin Walz served on the 17-person jury, which considered projects completed since 2010 in eight categories: commercial, health care, hospitality, institutional, landscape, liturgical, public space, and residential. Below are the winners and merit-award recipients. Algorithmic flock patterns take the form of 9,000 stainless-steel beads strung on wire in the lobby at the law firm Morris, Manning & Martin. Foshan, China The 77-foot height of the entrance to this design center allows for a cascade of polyurethane-resin chairs dipped in chrome. Beverly Hills, California The client’s extensive art collection, including a specially commissioned tapestry by Pae White and a light sculpture by John Wigmore, take center stage in gallery-like offices. San José, California Maxim Integrated’s silicon chips, used in iPhones, inspired the patterns hand-painted on the stainless steel and glass of a water wall at the company’s headquarters. Los Angeles, California When artist Louise Griffin was commissioned to create murals for two courtyards at a LA mental-health center, she turned birds into origami cranes and made the mountains simple triangular peaks. New Jersey A collection of more than 100 artworks intended to enhance wellbeing, such as James Perry’s mahogany spiral sculpture, positions this hospital at the cutting-edge of arts in healthcare. Floating Seeds, Owensboro Health, Owensboro, Kentucky Carothers worked with over 600 community members to cast seeds in resin pods that were then attached to fiber-optic lengths suspended from the ceiling. From the second floor, the seeds optically unify in the shape of the Ohio River. Health Care Merit Paul Housberg Perkins+Will Water Walk, Spaulding Rehabilitation Hospital The winner of the CoDA People’s Choice award turned what was an imposing elevator core into a sculptural element of mouth-blown sheet glass. Vitreous paint glows with the ambient light in the space, and the abstract patterns and colors mirror the water of the harbor outside. New York, New York A blowtorch oxidized the copper tiles composing a mural behind the reception desk at the Setai Fifth Avenue hotel. Hospitality Merit Rottet Studio The James Royal Palm, Miami, Florida An eclectic array of paintings, photographs, prints, and sculptures were selected by Interior Design Hall of Famer Lauren Rottet for the reinvention of this art deco hotel. Locals share billing with big names, the latter not necessarily front and center. Arlington, Virginia Pieces of perforated aluminum recall puffs from a steam engine, paying homage to the industrial past of the Renaissance and Residence Inn Crystal City Potomac Yard’s site. FODA Design The Spa at Playacar Palace, Playa Del Carmen, Mexico Large-scale blown-glass elements based on the Banyan tree that grows out the roof of the hotel lobby descend from the roof of the hotel’s new spa. Walnut Creek, California More than 4,000 books bound in different hues of gray fill a 26-foot-high by 8-foot-wide bookshelf, creating a “pixelated” image that reveals itself most clearly when viewed through a smartphone. New images can be made by rearranging books according to a coded matrix. New Jersey Walls of kiln-formed glass, patterned to suggest DNA mapping, function as way-finding devices at a Princeton University chemistry building. Institutional Merit Federico Muelas Antoine Predock Blue Flower/Flor Azul, University of New Mexico, Albuquerque On the western façade George Pearl Hall, drops of blue ink slowly expand in water on a 900 square-foot custom LCD screen. During the day the circular screen renders a low-resolution image of the ink, while at dusk the screen turns off, becoming a blank surface on which two Sanyo projectors broadcast the same image in high definition. Elkus Manfredi Architects Reflections of Energy, City Hall, Las Vegas, Nevada During an 18 month span, over 4,000 pieces of glass weighing 40,000 pounds were used to complete a monumental sculpture referencing the foundation of the nearby Hoover Dam. Vlieland, Netherlands At the music and arts festival Into the Great Wide Open, LEDs floated just below the surface of a pond, blinking in a computer-controlled sequence. Hangzhou, China In the city reputed as the birthplace of the umbrella, groups of them—with canopies in prismatic film—populated lakes in Xixi Wetland Park. Wuhu, China Four stained-glass containers, featuring phrases taken from the oldest extant collection of Chinese poetry, fill with water from hidden pipes, then splash into the pond below. Lanscape Merit Koryn Rolstad Studios Sheltering Aspen, Park City Plaza, Park City, Utah Aluminum structural posts designed to withstand inclement weather hold laser-cut PETG eco resin "leaves" that recall the Aspen trees in the area. Tampa, Florida Soaring curvilinear windows of translucent and prismatic glass mimic a plant reaching for the sun. Ostend, ?Belgium In a modern riff on Lorenzo Ghiberti’s Gates of Paradise, Ervinck’s polyurethane structure stands sentry at the front of a historic chapel turned arts space, protecting the original 1908 doors. Architron Radiance, University of Saint Thomas, Saint Paul, Minnesota Tim Harding’s set of textured-silk altar banners created for the Easter season of the liturgical calendar give the illusion of a source of light emanating from the crucifix above, neatly encompassing the Easter theme of resurrection, and renewal. Austin,Texas Artist Ben Rubin mined phrases from current television news items and historical CBS broadcasts—which flicker up, down, and across the façade of a campus building designed by O’Neil Ford. New York, New York Encouraging visitors to take the stairs at the Museum of the City of New York, 11,000 LEDs mounted on double-sided circuit boards glitter above. New York, New York Illuminated by red, green, or blue lights, three rooms at the Americas Society/Council of the Americas re­­invented a 1967 installation in Paris. 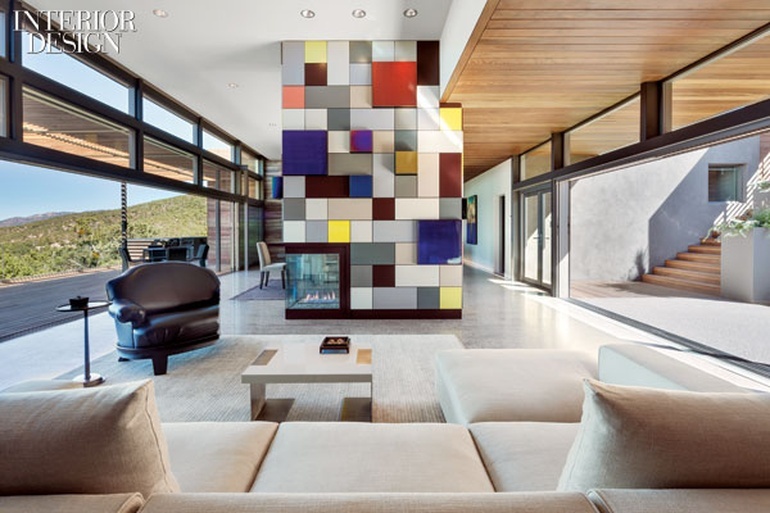 Santa Fe, New Mexico A fireplace is tucked into a grid of colors referencing the Southwest’s landscape—produced by?painting aluminum or anodizing it before adding dichroic film. Guadalajara, Mexico The private environments of the children’s bedrooms are emphasized by aluminum shutters designed by Guerrero. UNION31 88 Scott Condominiums, Toronto, Canada Echoing the natural materials of the building, Gangbar created City Freeze, an installation for the main lobby consisting of textured porcelain elements suspended by bronze cabling. Agraz Arquitectos Natalia house, Guadalajara, Mexico Screens of laser-cut aluminum and maple control light and privacy, creating a poetic dialogue between inside and out. To see the Top 100 ranking entries, go here; to see all entries, go here.